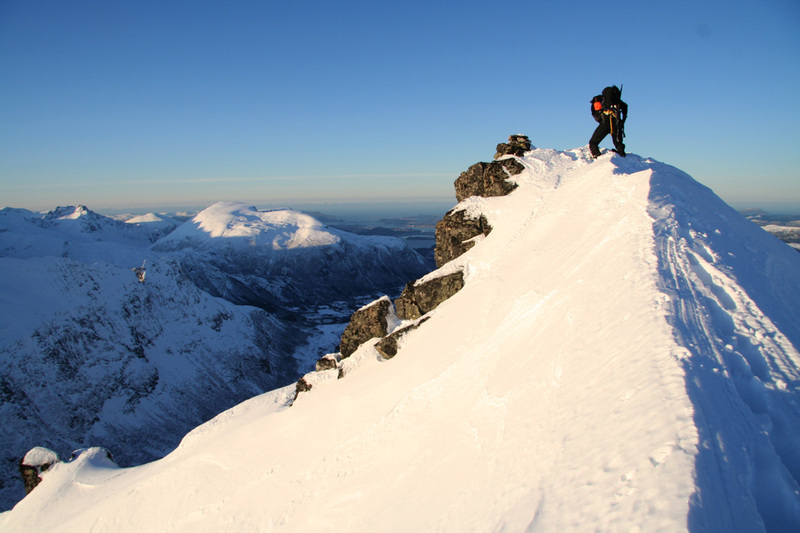 How to get there: This summit is easily reached from the city of Ålesund. First drive Hwy. 60 to Magerholm where there is a ferry crossing. Leaving the ferry, drive 16.6 kilometer passing the village of Sykkylven and look for a smaller road going right with the sign Brunstad. Take this road and keep right, going parallel to the main road, but in the opposite direction for 600 meter. Locate a local recycling station and park in such a way that no access is blocked. The elevation is 70 meter and the location is N62:17.459, E006:39.702. Route description: Walk up the small road that comes down here, keep left of the private house and enter the main Hwy. above. Walk left on this road for about 50 meter and locate the beginning of a forest road on the opposite side. It may be possible to park here in the summer, but in winter there is no parking. Continue up a long hill along the forest road. Ignore a fork that goes left. As you pass a second left fork, the road levels. Pay attention and locate a trail that heads straight up the hillside on your left. This is shortly before the forest road ends. The elevation here is about 225 meter. The trail heads steeply uphill, then slightly more gentle as it traverses right and gains the saddle Koppen, elevation 522 meter. It is best to carry your skis up the first, steep part of this section. 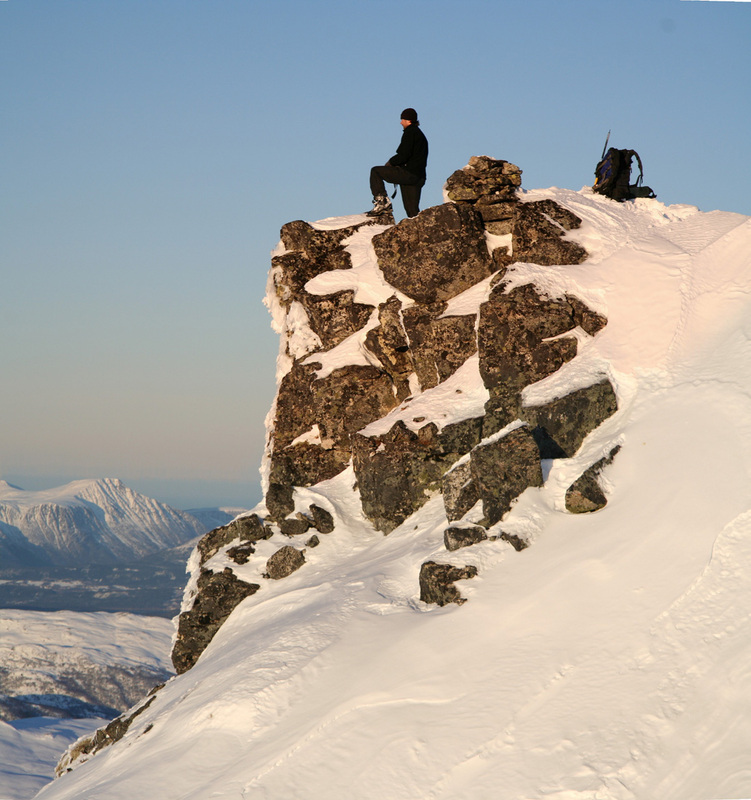 At Koppen, you see the initial ridge and then the broad slope leading up to the summit of Urfjellet. 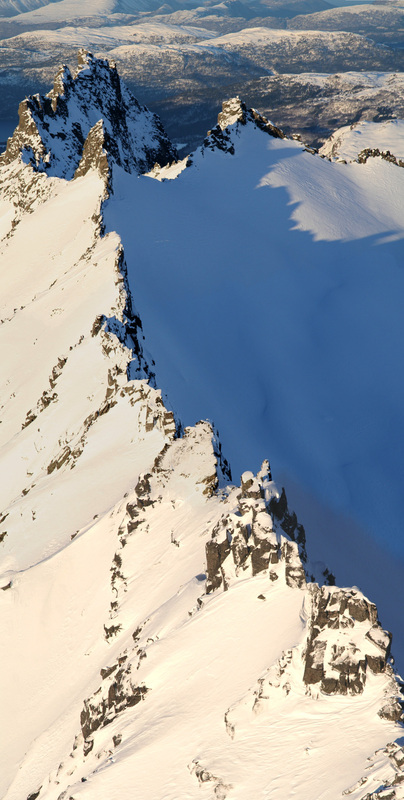 The terrain is good for skiing, in particular, the last 500 vertical meter. 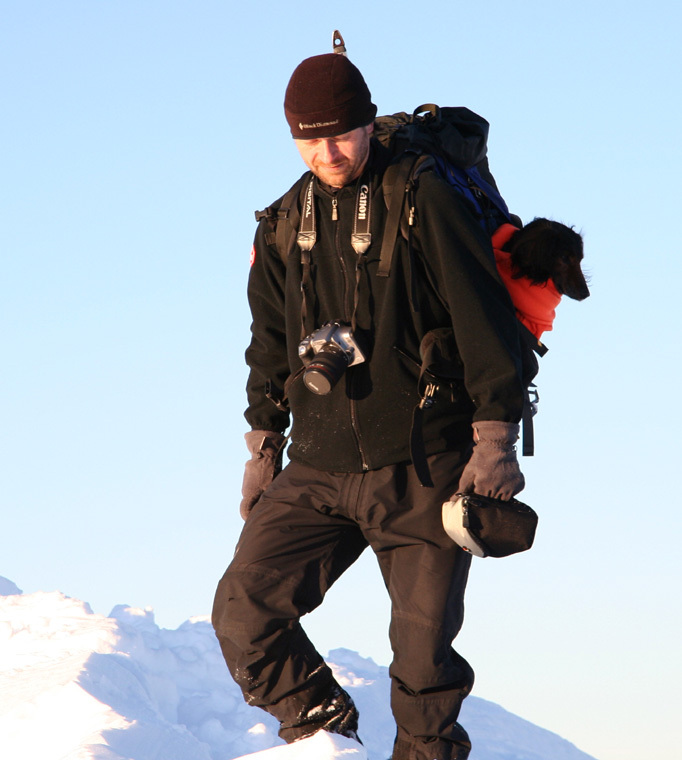 As you gain the summit plateau, there are two cairns where the slope ends, then a third, highest cairn about 25 meter out along the beginning of the ridge towards Hammarsettindane. Fortunately, this ridge is broad enough to give easy access to the summit point. Comments: I did this hike with Arnt Flatmo. We started from the car at 0945 and arrived at the summit at 1315, after 3.5 hours of pretty continuous uphill. After 30 minutes of photo activity, my lunch and lots of viewing, we headed down slope at 1345, reaching the car at 1500. The snow conditions were pretty nice, plenty of snow with a mix of crust and powder. 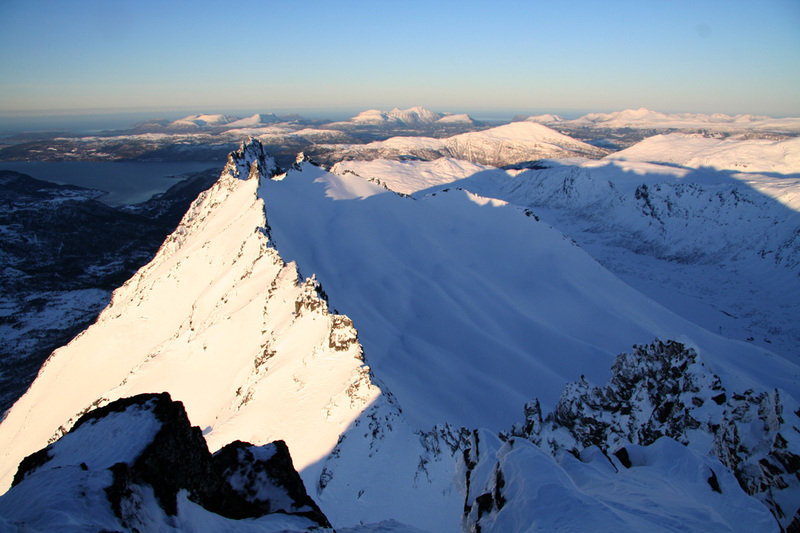 The huge summit slope extending some 500 meter vertical, offers good Telemark skiing. Many thanks to Jonathan de Ferranti for computer help in order to annotate the panorama pictures below. 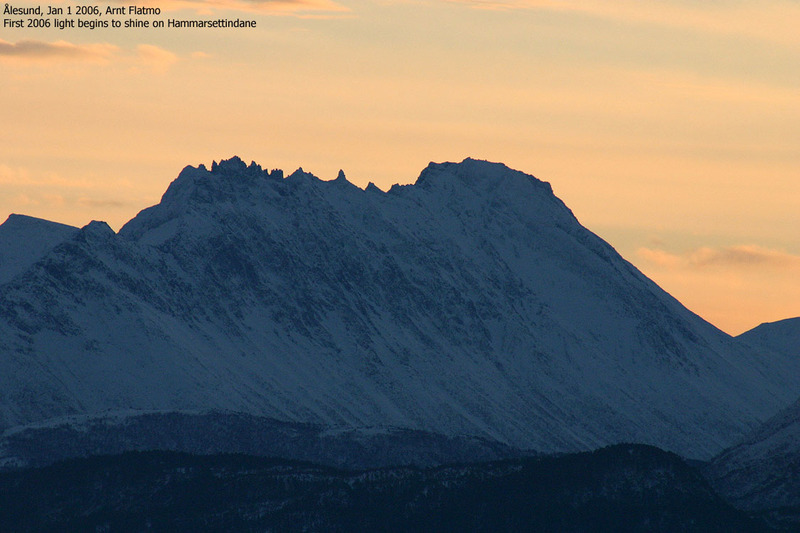 Urfjellet, the summit is at the rightmost end of the ridge. 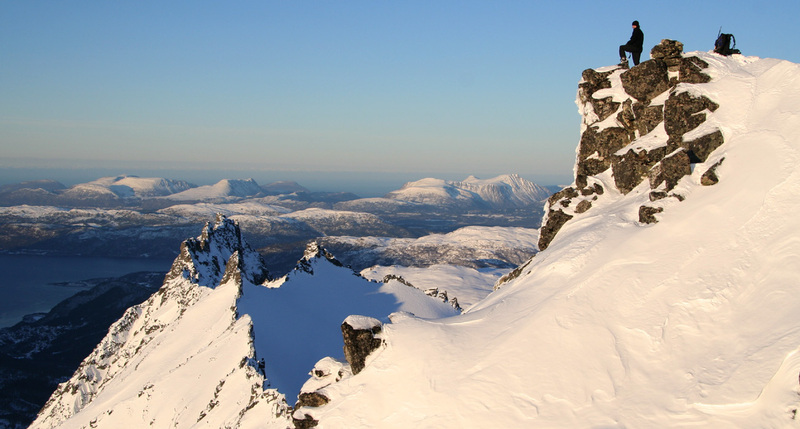 Urfjellet, first view, as seen from the Koppen saddle. 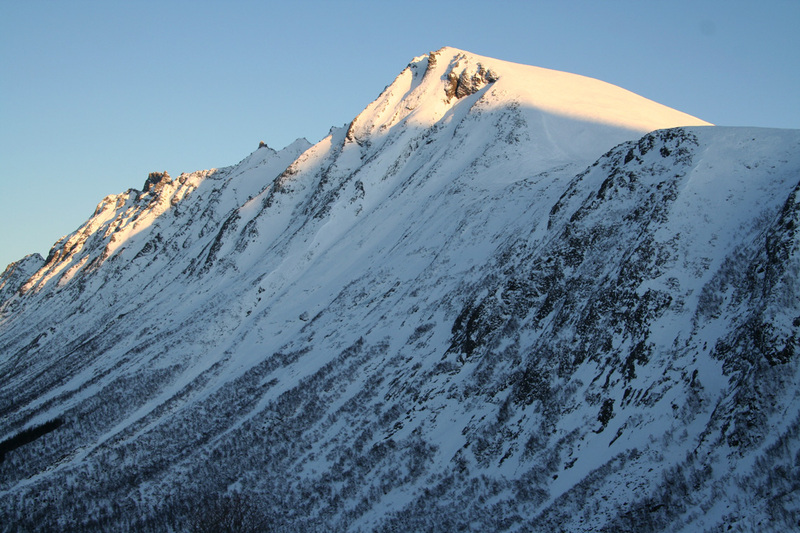 Hammarsettindane, a pretty difficult ridge extending north from Urfjellet. Arnt preparing to leave the summit. Arnt and Troll returning along the snow ridge. Arnt on the summit, closeup view. Summit Panorama I, north view. Summit Panorama VI, north. The city of Ålesund.